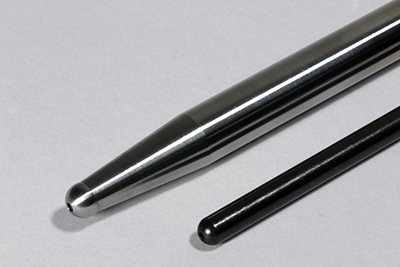 The Spintron was developed by Bob Fox at Trend Performance in the ‘90s to improve pushrods for race teams. Engine speeds were increasing dramatically in those days, especially in NASCAR and Pro Stock, and Fox needed a deeper insight into the how, why, and when of pushrod failure. 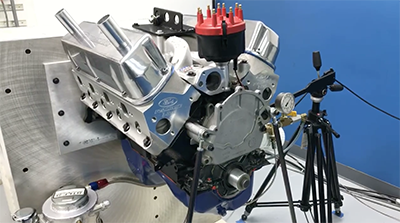 Working with Randy Dorton of Hendrick Motorsports, his rigorous testing led to one of the most significant reversals of conventional wisdom that had been religiously accepted at the time: a lighter valvetrain is better. The Spintron revealed massive pushrod flex in those days, especially during high-rpm running. Racers were changing their tuning not knowing that the pushrod was indiscriminately altering the cam timing, which altered the distributor timing. With further testing the Spintron exposed even more valvetrain issues. The Spintron uses an electric motor to spin the engine and a high-speed camera, along with a multitude of sensors, to log what the valvetrain is doing. From the outside, it looks like a regular engine bolted up large, multi-sided metal case. The engine, however, is somewhat of a dummy as the rotating assembly has been removed in favor of a straight mandrel (in place of the crank) connected to an electric motor inside the Spintron case. The motor and mandrel turn the engine’s timing set at various speeds so that data about the valvetrain dynamics can be gathered by a high-speed laser camera as well as other sensors. 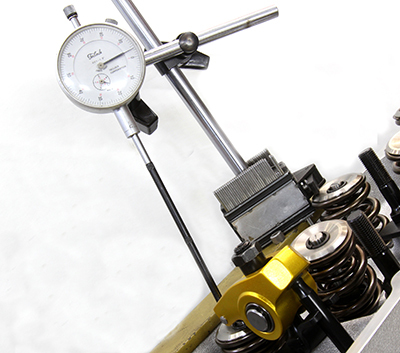 A dedicated lubrication system keeps the valvetrain oiled during testing. There are two types of Spintrons: a gear-reduction model that is used most often for valvetrain testing and a direct-drive version with a more-powerful motor that will spin a fully assembled engine. The latter model is used to analyze lubrication and frictional-loss issues. The Spintron can be fitted with sensors to monitor load and strain on various components in addition to temperature and pressure where needed. The most informative valvetrain analysis comes from the high-speed laser camera that is positioned in one cylinder through a hole in the cylinder block. It’s pointed directly up at the head of the valve to record movement at up 4,000 frames a second. Combined with the other sensors and sophisticated software, the laser tracks valve moment in relation to crankshaft and cam positions. Before the Spintron, conventional wisdom held that a lighter valvetrain was better. Nothing could be further from the truth. A step test helps engineers observe valvetrain differences at low and high speeds. The Spintron can also be programmed to replicate the actual engine rpm during a race to test the durability of each component. Simulating thousands of race miles, including shifting and pit stops, gives engineers a clearer insight into weakness or design flaws of these parts. It was in the earliest years of Spintron testing that Trend determined a lighter pushrod was almost always not the solution. The Spintron proved time and time again that deflection was costing engines valve lift, and most importantly, horsepower. Despite years of validation since those tests in the ‘90s, there are still engine builders who remain firm on a lighter pushrod. Shown is the laser camera mounted in a Cummins diesel block. This setup require a sacrificial block. 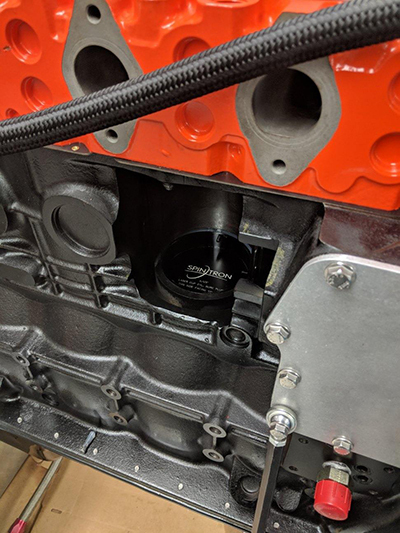 Engine builders who have used the Spintron often discover that even the minutest changes to a cam or rocker arm can greatly impact other parts of the valvetrain. So when a major change is made to the pushrod, it also impacts other components. Valve bounce and lofting are other unlocked discoveries gleaned from Spintron testing. Engine builders had long suspected the notion that the valve would literally bounce off the seat during closing in high-speed operation, but there was never any live data to substantiate it until the Spintron. Once the extent of the problem was documented, engineers could make adjustments or substitute parts to minimize the problem. Lofting was somewhat an unexpected but rewarding discovery. As engine speeds increase, the lifter can lose contact with the camshaft lobe. Literally, it’s thrown or lofted over the nose of the cam lobe. The result is that the valve remains open a little longer and the overall valve lift is a little higher than the original cam profile intended. Once engine builders got a handle on this dynamic, they were able to use it to their advantage. Valvetrain deflection equates to less lift at the valve and a subsequent loss of power. However, through certain mechanical trickery, racers have found ways to induce planned stresses that actually increase lift over what is built into the cam. This is called valve lofting. Racers have found they can basically trick the engines into more lift by weakening the valve train, purposely putting it into deflection. 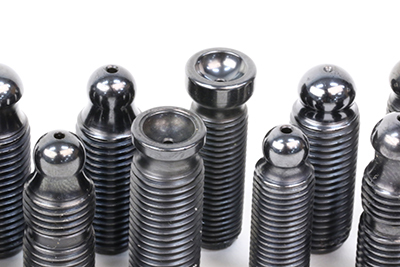 Lofting has turned out to be a useful tool for classes where rules limit valve lift or where flat-tappet lifters are required and cam lobe design is restricted. Again, testing on the Spintron will validate an engine builder’s theories on manipulating the valvetrain. 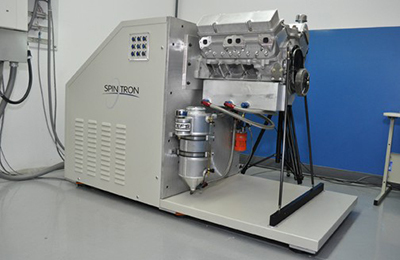 For teams that need the engine to last a 24-hour road race or a 600-mile high-speed oval-track event, the Spintron can be programmed to duplicate race operation so that components can be tested for durability without requiring hugely expensive, and possibly unobtainable, track time or tying up the dyno that could be used for development. Spintron testing has been an invaluable tool, teaching often unexpected lessons. 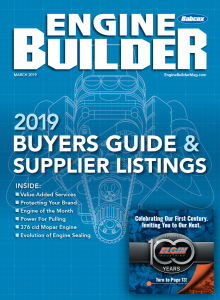 It has also been the catalyst for new product development for even more precise valvetrain components, such as precision rocker arm adjusters. One of the unique benefits to engine builders is that the Spintron data can overlay on top of actual race data gathered in the vehicle. This is particularly useful for detecting patterns and isolating individual valvetrain issues. Unlocking the secrets of engine operation is always a stimulus for new technology that improves performance. The Spintron is certainly one of the most useful tools for engine development, and the lessons learned continue to help engine builders make changes based on sound engineering and not supposition.